The Thoroton Plan Chest comes home! Members will recall the ‘Thoroton Plan Chest’ which was ‘discovered’ by Alan Wahlers at the offices of the Nottinghamshire Building Preservation Society at Southwell (see article in Newsletter No 86, Winter 2016). The chest had been donated to the Society by Henry Ashwell in 1904 (see article on Henry Ashwell by George Murfit in Newsletter no 90, Winter 2017). 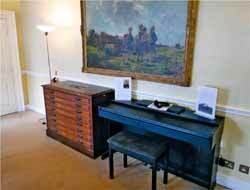 It is pleasing to report that the plan chest has been restored by Alan Wahlers and returned to its former home at Bromley House Library, and is, appropriately, in the Thoroton Room. For those curious to know what the drawers now contain, it can be revealed that there is a collection of music scores at Bromley House which are safely stored in the Thoroton plan chest. Southwell Community Archaeology Group (SCAG) has received a £10,000 Sharing Heritage grant from the Heritage Lottery Fund (HLF) for an archaeological investigation of the gardens at Vicars Court & Orchard land on Church Street, Southwell. The land on which Vicars Court & the Orchard stands is part of the Southwell Minster assemblage. The site lies partly within a Scheduled Ancient Monument - Roman Villa Complex and Anglo-Saxon Cemetery and is next to the site of the former Minster School. That land has been gifted to the Dean and Chapter for heritage and community use. John Lock, the chairman of the group, says it is fitting that ten years after the group was formed to bring to public attention the risk by development to the adjoining parts of the Villa complex, that this very important piece of the wider assemblage is being investigated for the first time with the aid of the HLF grant. This is a multi-disciplinary project being undertaken with the agreement and support of the Dean and Chapter and under professional guidance and involvement with Historic England and the County Archaeologist. In addition to its research potential the project will further enhance and develop the skills and understanding of SCAG members. VIII. Throughout the project the membership and wider community will be kept informed of the progress by the use of social media and web-based reports. Articles will be published in the local press and community paper. At the conclusion of the project there will be a public celebration event on or adjoining the project land which will include display of the material discovered and the survey work completed. The project plan includes the preparation and publication of a popular booklet to be part of the story of Southwell for the community and visitors. If the final results are of significance a peer-reviewed paper will be offered for consideration as a publication in the Transactions of the Thornton Society. In 2018 the Sherwood Forest Archaeology and History Project is celebrating entering its sixth year under the leadership of Mercian Archaeological Services CIC (see the website mercian-as.co.uk/sherwoodforest.html). One of Mercian's directors, Andy Gaunt, provides a summary of the project below. At Mercian we are extremely proud of all the work we have done so far in and around Sherwood Forest, promoting the heritage of Sherwood Forest through community involvement. Sherwood Forest is a place of myths and legends known throughout the world as the home of Robin Hood, and the Sherwood Forest Archaeology Project enables people from all walks of life to become involved in an amazing community archaeology project. The project undertakes research of the highest quality and involves people both local and from afar in researching this wonderful ‘Landscape of Legends’. The project seeks to investigate, interpret and promote the heritage of Sherwood Forest and bring back a sense of the wider historic landscape. Watch this space for impending announcements regarding the "Future of Sherwood's Past"
Undertaken dozens of projects at King John’s Palace (the former royal hunting palace at the heart of mediaeval Sherwood), Mercian’s Andy Gaunt identified the landscape of Clipstone as a designed medieval romance landscape, and Mercian have revealed the size of the palace, which was previously unknown, undertaken geophysical surveys, topographic surveys, trial-trenching, test-pitting and archaeological excavation. We have trained dozens of people at our annual fieldschools - with this year’s school already filling up with delegates for the summer http://mercian-as.co.uk/fieldschool.html, and helped to raise the profile of the site and ensure its protection for the future. Mercian’s work at King John's Palace has resulted in the extent of the protected area being reviewed to ensure future protection. After all our hard work we are very proud of this fact, and we are working tirelessly to ensure the whole palace is protected properly. We have dug in the village of King's Clipstone to investigate the origins of the settlement, to tie in with our research aims of understanding the settlement pattern and landscape of the Forest. We have dug, and surveyed at the site of Thynghowe - a Viking Meeting site at the heart of the Forest and its surrounding landscape mercian-as.co.uk/thynghowesfap.html with our friends at The Friends of Thynghowe and the Forestry Commission, including a large community excavation in 2016. The work so far has helped to reveal and interpret the scale and importance of this potentially internationally significant site which had been overlooked and forgotten until recent time. We have dug in Robin Hood’s village of Edwinstowe with members of the village and community volunteers from our friends at Sherwood Forest Trust. We are returning to Edwinstowe for more archaeological investigation in the early summer to tie in with the Major Oak Woodland Festival. We have surveyed, fieldwalked and test-pitted at the site of St Edwin’s Chapel in Clipstone and begun fieldwork at the site of Edward Il’s fortification at Beeston Lodge known as Clipstone Peel. We are currently undertaking a survey of the historic woodland of Birklands and Bilhaugh (home of the Major Oak, legendary hideaway of Robin Hood) as part of the Sherwood Forest National Nature Reserve Survey (you can come and be a part of this survey which will run over the next 5 years, see mercian-as.co.uk/intro days.html#birklands). This project uses LiDAR data from the Friends of Thynghowe to inform walkover survey, with every feature discovered being photographed and recorded. The project will continue in March with a survey training session (mercian-as.co.uk/training days.html) mapping in high detail military pits, medieval holloways, ridge and furrow and possible WWII building platforms. We hope to include geophysical surveys and more into this exciting project soon. As part of the Sherwood Forest National Nature Reserve Survey we are also surveying the ancient heathland of Budby Common to the north of Birklands wood for the RSPB. This initial level one survey is recording hitherto unknown boundary banks and ditches, lots of ridge and furrow, and trackways and holloways. The first phase of research is already changing the interpretation for the heath. At an Extra-Ordinary General Meeting on November 22nd 2017 it was decided to disband the Society as laid down in its constitution. It was a unanimous but sad decision by the few members left, due to a fall in membership for years, resignations from the Committee coupled with a lack of replacement nominees, deaths and the lack of interest shown by younger people. The Society was formed in 1984 by Karl Routledge-Wilson, Brenda Summers, Yvette Pollitt and Margaret Gardner, with Keith Train agreeing to be President. Subsequently, Rueben Carlisle, Alf Bowley and Bill Russell also filled this post. Stan Smith, a well-known figure in local history and writing circles, became Chairman in 1987 following the resignation of Dennis Cooke, and remained so until his death in 2016. Stan was the leading light in the Society for all these years, hiring speakers for the monthly meetings, arranging trips and editing the Basford Bystander. This is the Basford and District newspaper he introduced which is issue every other month. It covers Old and New Basford, Aspley, Cinderhill, Hyson Green, Carrington, Sherwood, Radford, Broxtowe, Bulwell, Highbury Vale &c. It contains local news, nostalgic memories and more serious local history articles and is thought to be unique in the county as an adjunct to a local history society. Brenda Summers was the Secretary until her untimely death in 2001, when Christine Smith, Stan’s wife, took over. She remained in the post until the very end and will continue to edit the Bystander for as long as possible. Yvette Pollitt served as Treasurer for the whole of the Society’s existence. Bill Clarke was the official Photographer and gave slide shows to other societies, always donating his fee to Basford History Society. He and Alf Bowley were also regular members of the Thoroton Society. The Society’s members produced several publications, including Basford Probate Inventories from 1821-51, The Green - A Journey Through Time (about Hyson Green) and Basford between the Wars 1919-1939. Nine members under the editorship of Alf Bowley contributed to the latter. The Moores of Old Basford, George Pallant’s Basford and Cinderhill, Bystander Cream (the best of issues 1-10 of the Bystander) and Bystander Bulwell were edited by Ztan Zmith (Stan’s pen-name). At first, the winter meetings from September to May were held at Vernon Road Library, but when that became unsatisfactory the Society were offered the Clover Green Community Room, Old Basford. In the summer months, trips were organised to local areas such as those with Peter Hammond, and further afield such as the one to Chesterfield with Alf Bowley and to Lincoln with the late Jack Cupit. Sadly, there was little interest in these outings in later years. Christine Smith will continue to publish the Basford Bystander and requests that anyone who has memories they would like to share to contact her at 44 Cherry Tree Close, Brinsley, Nottingham NG16 5BA, telephone 01773 783009. The members of the Basford Local History Society generously donated £186.90 to the Thoroton Society on winding up the Basford society. This money will be put towards the page costs of a suitable article in a future issue of the Thoroton Transactions - Ed. Sadly, we have to report that another of our faithful members has died. John Banks was a Nottingham boy who attended the Nottingham High School and then ministered to various parishes in the county all his life, apart from a brief spell in Oxford. He was an interested historian, especially in the history of Nottinghamshire, which led to his membership of the Thoroton Society. John was born in Sherwood and worshipped originally at Saint Martin’s Church, before pursuing his Theology Studies at Oxford University, and at Westcott House Theological College. Ordained in 1958, John’s first post was at Warsop (1958-1961). He served for three years in the parish of Saint Aldgate and Holy Trinity, Oxford, before being appointed to Ollerton and Boughton for eleven years. He became Rector of St Leonard’s Wollaton from 1975 to 1983. After a period of ill-health, John helped at Bramcote and Arnold parishes until he retired in 1995. John was much loved wherever he was; he was a people person and was always deeply interested in other people, especially those who were facing mental difficulties in their lives. His preaching was always passionate about the Gospel, a love which he always radiated in his life. He was a faithful priest and was much influenced by the example of the saintly Bishop of Southwell, Russell Barry, who often figured somewhere in John’s sermons, as did his love for cricket. He led the Diocesan Cricket team for a number of years. John died peacefully on 1st February and leaves a widow Sue, and three sons, one of whom is also a priest. His funeral service was held at Ravenshead, where a very large congregation mirrored representatives from most of the parishes where he had served.